1) EU Parliament insists on EU Military Union "without delay"
In this post, we will be discussing the Antichrist's 7-year treaty with Israel. We will also be discussing 7-year initiatives the EU has, especially one's that relate to Israel or military security. 7-Year Covenant: What Does the Bible Say? A "week" is indisputably a week of years (7 years), since in the context of the entire prophecy, a week is always 7 years. Since the entire prophecy is decreed for the Jews and Jerusalem, end time Israel is one of the parties to this covenant. (Other prophecies support this idea). The creator and/or enforcer of the covenant is of "Roman" descent, since Daniel 9:26 states that he is of the same ethnic group of those who destroyed the temple in 70 A.D. This is why many commentators, theologians, and end time movies portray the Antichrist making a 7 year "peace treaty" with Israel. He then apparently violates it in the middle, ending the temple sacrifices. In this way, he betrays Israel, whom he was supposed to protect. This event seems to coincide with the Antichrist's invasion of Israel (Daniel 11:41; cf. Zechariah 12). Most importantly, halfway through this 7 year covenant, "one who makes desolate" comes on the "wing of abominations." This is one of the only three times the abomination of desolation is referenced in the Old Testament, all of which are in the book of Daniel (9:27; 11:31; 12:11). The 11:31 abomination of desolation refers to a prophecy that was fulfilled in 168 B.C., where Antiochus IV Epiphanes invaded Jerusalem and placed an idol of Zeus on the temple altar. This sets the precedent for the meaning of the term abomination of desolation, as an idol placed in the temple. Daniel 12:11 refers to an end time abomination of desolation, around the time of the general resurrection of the dead. 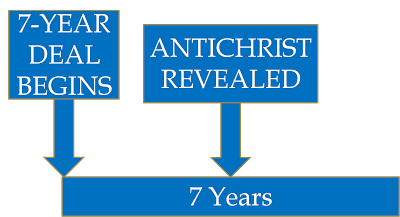 This leaves Daniel 9:27, where an abomination of desolation event happens halfway through a covenant created by the "Roman" Antichrist, described above. However, 9:27 is unique in that the more literal translations speak of the abomination as if it is a person, and not an object as was the case with the idol of Zeus. Here, it is implied that a person is the idol in the temple, as opposed to a mere object. This is consistent with in the Olivet Discourse in Mark 13, where Jesus describes the abomination of desolation using a masculine pronoun. “But when you see the abomination of desolation standing where he ought not to be (let the reader understand), then let those who are in Judea flee to the mountains. (Mark 13:14 ESV). Paul is more explicit, when he describes the man of lawlessness who sits in God's temple, proclaiming himself as if he is God. This mans arrival is accompanied by counterfeit signs and miracles that deceive the unbelievers. This is consistent with Revelation 13, where everyone is forced to worship a talking image of the Antichrist, whose authority is vetted by the false prophet. The false prophet also performs miraculous signs on the Antichrist's behalf via demonic means. Regardless, all this is to show that the 7 year covenant in Daniel 9:27 is extremely important in determining the timing of end time events. It is the only prophecy that tells, in advance, when the final singular sign of Christ's return will be. This is very significant, because Jesus describes his return with great immediacy. What 7-Year Programs Does the EU Have? EU sets up its relationship with it's "neighbors" using the European Neighborhood Policy. It was an idea that the then foreign policy chief Javier Solana and the Commission came up with. In this program, the EU essentially paid participant countries for good behavior. The EU would set up an "Action Plan" for each country, that would be tailor made to that nation. For example, some goals in the action plan might be reducing corruption, or having fair elections, etc. Interestingly, a map of the ENP members looks conspicuously similar to a map of the Roman Empire at it's greatest extent. The European Neighborhood Policy was funded through a variety of financial mechanisms. However, they wanted to consolidate it into one finance mechanism that worked on the same time frame as the EU's budget. As a result, they confirmed the ENP for 7-years using the European Neighborhood and Partnership Instrument (ENPI). Israel was a member country, along with several other Mediterranean and Eastern European nations. The "Arab Spring" prompts EU officials to review and update the ENP. In this review, they added a "conditionality" component, in which more cooperative nations would receive more funding than those who did not. 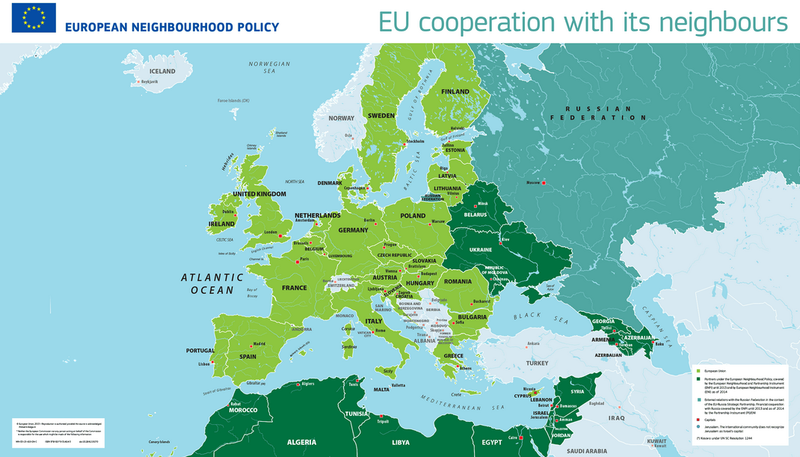 The European Union replaces the 7-year ENPI with the 7-year "European Neighborhood Instrument. It reconfirms the ENP with new funds for the next 7-years. Many policy thinkers and analysts began to point out the ineffectiveness of the ENP. The Syrian civil war, Russian intervention in Ukraine, and instability in Libya, among other things, contributed to this view. Instead of the ENP causing the EU to have a "ring of friends" around it, instead it now had a "ring of fire." This caused the EU to revise the ENP, focusing more on stabilizing the surrounding neighborhood. This is in contrast to its previously overly idealistic approach where the EU hoped that democracy and human rights would prevail in the neighboring countries. EU Parliament endorses a plan to create a military union, with a view to its establishment for the next 7-year budget. This "European Defence Union" could be used, among other things, to intervene in crisis situations in neighboring countries. "encourages the European Council to lead the progressive framing of a common Union defence policy and to provide additional financial resources to ensure its implementation, with a view to its establishment under the next multiannual political and financial framework of the EU (MFF);"
In December, the EU proposed a "defence fund" with two parts. The first part is a military research fund, providing up to 500 million euros annually for the 7-year period 2021-2027. The second part (which is financed through other means) proposes giving group discounts to member countries who want to buy military equipment together. It's easy to see how all of this could ultimately converge in a future ENP* (or other) agreement, in which Israel is guaranteed protection in exchange for a final status agreement with the Palestinians. Europe has an incentive to stabilize and even "protect" it's neighborhood, so as to stem irregular migration flows and deter terrorist attacks from unstable regions. In view of the converging themes, a logical step could be to make the next 7-year budget/ENP a covenant of protection for Israel. This would inaugurate the final 7 years prior to Christ's establishment of his kingdom. This would place the abomination of desolation, and the revealing of the Antichrist, in summer of 2024. That's all for now. As always, I enjoy hearing from you all and the insights that you have. One thing is for sure, this prophecy road is an adventure. What makes this adventure so cool is that God is driving. I remember in 2014-2015 I was racking my brain, trying to make the theory "fit." You all wisely stated that God would be the one to put it all together. And indeed, that has turned out to be the case. We did not make any theory "better." But God, in his wisdom, continues to surprise us with new prophecy news every few months, to his glory. *Weirdly enough, leading Antichrist candidate, Javier Solana, was quoted on Twitter as saying that the ENP is "over." However, Solana obviously does not think the "Union for the Mediterranean" program is dead, since he was recently video taped at a UfM event discussing the importance of such a program. This is a sub-program of the 7-year ENP, and is financed by it. 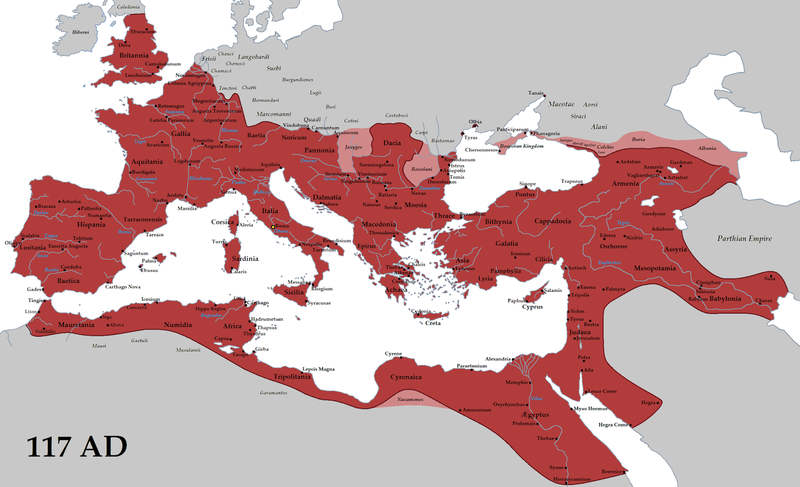 The UfM is important because it is tied to the 7-year ENP and is very "Romanesque," in that all the member countries (+Israel) look like a map of the old Roman Empire. One can easily see that Solana doesn't want to abolish the EU's relationship to Israel, considering he endorses the UfM. In addition, he is one of the main proponents of stabilizing the neighborhood using military force. Though this is speculative, perhaps he disagrees with the current ENP framework, where neighbors are paid for good behavior. Are you aware of all the hype about the fall of 2017, and/or the year of 2018 ? Something big might occur, and if I had to bet, I would bet that something prophetic is going to happen, but I'm not sure what exactly. Some think Jesus is rapturing the Philadelphian Church in the Fall, while others think Jesus is rapturing all of the true church, while others surmise whether an agreement to rebuild the temple will occur in the Fall, or whether the temple will be built very soon (Fall or in 2018). People relate this to the Revelation 12 sign, that is hidden in the sky. It cannot be seen from Earth, but only with astronomy, astrology, and Bible Prophecy has it been discovered.